← The gift of encouragement. “The only way out is through.” These wise words were spoken to me some three decades ago, during my initiation into a way of life based on the 12 steps of recovery. The friend who shared this wisdom was communicating the importance of not only acknowledging but also delving into the baggage that I had accumulated thus far. This jibes with the recovery wisdom that tells us that our past is our greatest asset – if we are willing to mine it for all it has to teach us about ourselves, about being human and about growing into the awareness that we are part of God’s magnificent creation. That we are loved and embraced where we are. And that we can never hope to get to where we’d like to be without acknowledging and accepting where we’ve been. Sadly, the dear friend who imparted this wisdom to me – the only way out is through – is no longer with us. He chose many years after our friendship began to end his own life. A mutual friend tracked me down in California to share this painful news. Many of us, who together had found recovery in the early 80s, were still around to try to piece together a sense of what went wrong. Much had transpired for each of us since those early days; it had been years since any of us had been very close to our friend. 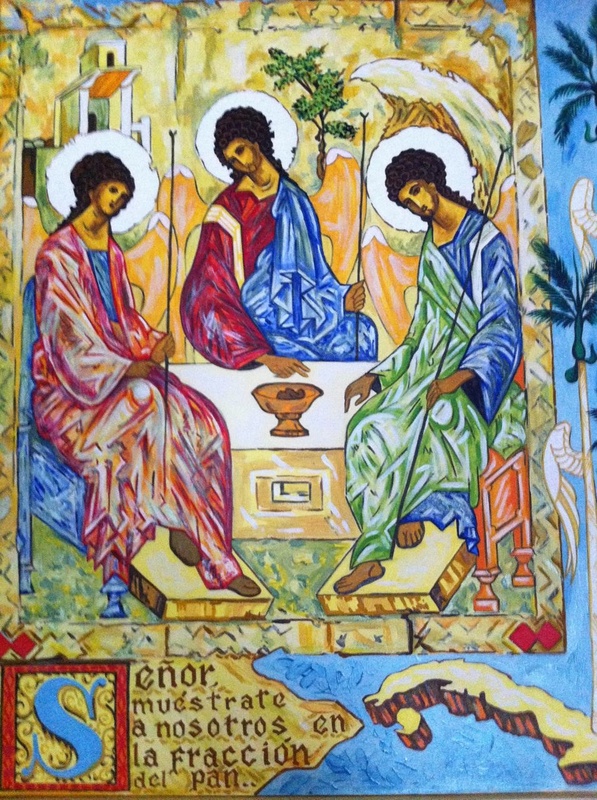 As I think now about our friend – and as I explore this beautiful icon, often referred to as the Old Testament Trinity, illustrating Abraham’s three visitors at the oaks of Mamre – I cannot help but think of the importance of community. We need each other. I need you. It is true that no human power can relieve our greatest difficulties, that we must depend on a power greater than ourselves. But we learn this and we are reminded of this in the context of community. The rich, revealing stories of others give me hope to imagine a new story for myself. The honest gift of such stories reminds me that God never gives up on us. My particular faith tradition turns first to Holy Scripture as the source of all things necessary for salvation. We also rely on the rich tradition of the community of faith that has come before us, practicing faithfulness and service to God and neighbor. And we also rely on the gift of reason. We practice our faith together, in community, and we prayerfully reflect on our lives. We find God revealed in scripture, in worship and in the faces and lives of one another. In many ways, this way of life — echoed in the 12 Steps — is a lovely, subtle example of liberation theology, a way of living and growing in faith that has been falsely appropriated and politicized by a few pundits. On close examination, this theology presents a beautiful way of being in community that offers hope and transformation for those often marginalized or otherwise rejected by systems of power and privilege. This entry was posted in 12-step spirituality, Christianity, Episcopal church, faith, Recovery and tagged 12 Steps, 12-step spirituality, Christianity, community, hope, liberation theology, mercy, recovery, spiritual growth, Trinity. Bookmark the permalink. 2 Responses to The only way out.